« The Sky is Falling !! Mark Hulbert is suggesting that the recent gold decline is just a correction, and not the start of a secular decline. He is basing this on the analysis of his gold newsletter sentiment measure. In late April, as the gold stocks were beginning to top, the Hulbert Gold Newsletter Sentiment Index was at 73.2%, almost at its all time high of 90%. Now it stands at 1.8%. This quick and massive retreat shows that people are not stubbornly insisting on gold stocks to go up. Notice that on March 21st and 22nd, the Gold Bugs Index (HUI) had put in two hammers. 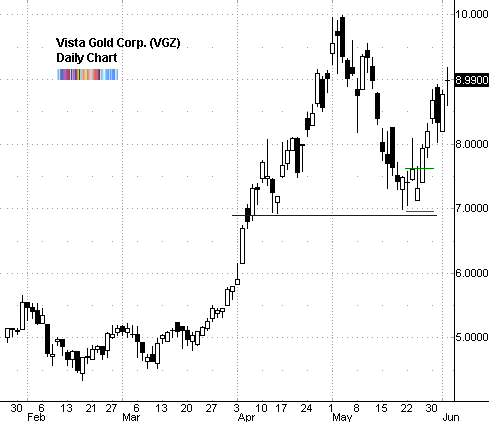 On VGZ, for those two days, there were two back to back candles with long lower tails. The long lower tailed candles showed that there was considerable support at the $7 area. As well, this was an area of support from mid April (blue line). A good entry long was above the high of the two candles ($7.60), with a stop loss below them (see green and red lines). You could have also put a stop loss below the $7 level to make sure you avoid potential whipsaws. The target would be the congestion area at the previous high of $10 to $9 - which has almost been reached now.